Details of the Pickersgill family living in and around Grewelthorpe.Information taken from census returns and Parish records . Last update Jan. 2019. Shirley Cherry wrote [April 2018]. Henrietta Pickersgill was my late husbands grandmother. I would be interested in seeing the family tree which I believe David Pickersgill has prepared. He must be Barrie (my late husbands) cousin. I sent her Dave’s tree. [Barbara]. Nicola Simpson is researching the Pickersgill family. She writes.“I am researching the Pickersgill family. I have traced back as far as John Pickersgill who I believe married Sarah Beckwith in Kirkby Malzeard in 1701. He baptised two children, Charles in 1701 and John in 1704. On both baptism records he is listed as John of Thorpe. He died in Grewelthorpe in 1704. Can anyone tell me if Thorpe is a different place to Grewelthorpe (there are other baptisms recorded as of Grewelthorpe on the same day)? And does anyone else have any information on this family? Oct 2011.If you can help Nicola please contact the site. June Howell writes. Sept. 2011.In the P.R’s of Kirkby Malzeard I located the birth of my ancestor Joseph Pickersgill baptised 1803 son of George of Grewelthorpe. I also located the marriage of a Mary Metcalf to a George Pickersgill which took place in 1799. Joseph married Ellen Hood of Baldersby at Helperby and had their two first children Bt. there. Mary 1833 and George 1835. The family then moved to Dewsbury where on the 1851 census Joseph said that he was born at Ploverhill, Thorpemore. As the Metcalf’s lived at Ploverhill Farm Galphay I am assuming that it could be there. Does any one know about this family?.If you can help June please contact the site. Thanks to Dave Pickersgill for access to his tree. [May 2012]. Some of Daves research differs from other information I have received. I have made a note where this happens. Thanks to Ian Williamson for information about Jennett Pickersgill. [Jan 2014]. Photographs sent by Paul Underwood of Torquay, April 2014 of a stone bearing the Pickersgill coat of arms, found in his garden. Inscription says Quae recta sequor . I will only do what is right. If you have any information we can add to this page please contact the site. 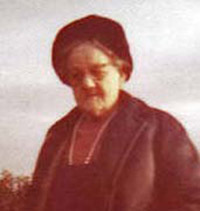 AGNUS PICKERSGILL. Born 1834 Grewelthorpe. married James Gill. of Fearby in 1861. ALICE PICKERSGILL. Bap 19.10.1742 East Witton. Dau of Jon. [Ref IGI]. ALICE PICKERSGILL. Born C. 1862 Masham. Dau of William [the groom] & Elizabeth. ALICE PICKERSGILL. Born 1879 Galphay. Dau of Thomas & Mary Metcalfe. Married John Binks. of Bingley on 15.6.1901. ALICE PICKERSGILL. Born 1916 Ripon area. Mothers name Heward. AMELIA SOPHIA PICKERSGILL. Born 1818 in London. Dau of Thomas of Grewelthorpe & Ann Cook. Married Leonard Carter. of Oxford. ANNA PICKERSGILL. Born June 1883 Ripon. Dau of Thomas & Mary Metcalfe. ANN PICKERSGILL. Born 1600 Masham. Dau of Christopher & Ann Hodgson. Married Richard Beckwith. in 1633. ANN PICKERSGILL. Born Jan 1691 Died 1691. Dau of John & Ann Wrigglesworth. ANN PICKERSGILL. Born C 1730 Ripon. Married Stephen Bland. of Hartington. on 18.2.1751. [Ref.IGI]. ANN PICKERSGILL. Bap 4.5.1766 Ladyhill. Dau of Charles. ANNIE PICKERSGILL. Born C 1866 Masham. Dau of William [the groom] & Elizabeth. ANN PICKERSGILL. Born 1881 Galphay. Dau of Thomas & Mary Metcalfe. CATHERINE PICKERSGILL. Born C. 1890 Knaresborough. Dau of Joseph [Farmer] & Eleanor. CHARLES PICKERSGILL. Bap.6.12.1701.Kirkby Malzeard. Son of John & Sarah Beckwith. [Ref.IGI]. CHARLES PICKERSGILL. Bap. 11.4.1730 Kirkby Malzeard. Son of John. [Ref. IGI]. CHARLES PICKERSGILL. Bap. 9.6.1759 Kirkby Malzeard. Son of Charles. [Ref. IGI]. CHARLES PICKERSGILL. Born C. 1775. Buried 3.3.1848 Grewelthorpe age 73. CHARLES PICKERSGILL. Bap. 8.1.1766 Dallowgill. Son of Charles. CHARLES PICKERSGILL. Married on 10.6.1799 at Kirkby Malzeard to Elizabeth Beck. He was a husband man. CHARLES PICKERSGILL. Born C. 1798 Grewelthorpe. A horse breaker & groom. Married to Prudence of Colsterdale. Living Ellingstring in 1871 a widower. CHARLES PICKERSGILL. Bap. 13.11.1807 Richmond Heave. Son of George & Mary Metcalf. Married Elizabeth Beck. CHARLES PICKERSGILL. Born C 1861.Masham. Son of William [the groom] & Elizabeth. Joiner’s Apprentice. Married Amy Wilkinson. of Masham. CHRISTOPHER PICKERSGILL. Married Ann Hodgson. 29 June 1600 in Masham. Died 1619 Masham. CHRISTOPHER PICKERSGILL. Bap.17.7.1720 Kirkby Malzeard. Son of Christopher. [Ref. IGI]. CHRISTOPHER PICKERSGILL. Born C. 1819 Studley Roger. Son of Simon & Elizabeth Lofhouse. Carpenter, Married Elizabeth Gregg. Was a widower living Brewers Arms Inn at Azerley in 1891. CHRISTOPHER PICKERSGILL. Born Born C 1848 Galphay. Son of Christopher & Elizabeth Gregg. Married to Margaret of Grewelthorpe. A joiner Living Middlesborough 1891. CHRISTOPHER PICKERSGILL. Born 1886 Galphay. Son of Thomas & Mary Metcalfe. DENIS PICKERSGILL. Born C. 1864 Galphay. Son of Simon & Catherine. DOROTHY PICKERSGILL. Born C. 1675 Mickley. Died 3.12.1745 Masham. Buried Kirkby Malzeard Church. Married William Beckwith. of Lamb Hill. See Beckwith page. [Ref. History & Antiquities of Masham]. DOUGLAS PICKERSGILL. Born C1904 Masham. Son of Joseph [the grocer] & Rose.EDGAR PICKERSGILL. Born 8.8.1895 Mrton le Moor. Died 24.8.1971 Dishforth. Married Henrietta Pratt. in 1920 in Ripon Cathedral. Henrietta born 23.1.1895 died 9.3.1976. David Pickersgill sent the following memories of Henrietta his grandmother.Henrietta lived at Laverton far some years, her house was the 3rd one down the road heading toward Ripon, from the church on the left, on the right was a farm that l believe was own by a German family with two children the same age as myself, one boy and girl, did not have much to do with the adults, but all three of us would play in the barn or in the field across the stream.Henrietta had 11 children in all. but the only ones I remember staying there when I was there was Richard, there was a stand pump on the main road with an old stone tub under it that I would get water out for the horse in the field behind the pump.l think twice a week a large van would come around selling food etc from it but on a Thursday, Gran and myself would walk to Ripon market and back.The toilet was a 10 gallon drum that was emptied every week, Henrietta would close the curtains until the wagon left. we had a large garden at the back of the house, and she would grow all her own veg and herbs, once when playing at the farm, the goat snapped the rope and butted me to the ground, the farmers wife took me home and gran went into the garden, got some grass as l called it, put me in the tin bath with the grass, five minutes no pain or anything.Gran never did like doctors, every week Gran was in the church next door helping out but she always called it the chapel.doing the search on the family, Edgar went from Ripon to Marton le Moor to work on the farms, but most of the males went into army and then worked on the land, George still own the farm at Copt Hewick,Charles Pickersgill lived at KM for all his childhood, but when he was 14, went to work at Studley Hall. EDWARD PICKERSGILL. Bap.30.7 1726 Kirkby Malzeard. Son of Charles. [Ref.IGI]. EDWARD PICKERSGILL. Buried 30.5.1755. Lived in Grewelthorpe. ELIZABETH PICKERSGILL. Born 1713 Masham. Dau of Thomas & Elizabeth. ELIZABETH PICKERSGILL. Born C 1757 Masham. Married to Joseph Atkinson. on 17.12.1778. ELIZABETH PICKERSGILL. Born C 1773. lived Bramley Grange, Grewelthorpe. Buried 13.10.1840 age 67. ELIZABETH PICKERSGILL. Born C. 1845 Galphay. Dau of Christopher the carpenter & Elizabeth Gregg. Unmarried living with Father in Azerley in 1891. ELIZABETH PICKERSGILL. Born 1885 Galphay. Dau of Thomas & Mary Metcalfe. EMILY PICKERSGILL. Born C. 1882 Masham. Dau of William [the groom] & Elizabeth. ESTHER PICKERSGILL. Bap. 27.12.1805 Richmond House. Dau of George & Mary Metcalf. FRANCES PICKERSGILL [nee Walker]. Buried 11.4.1727 lived Grewelthorpe. Widow of William of Aldburgh. GEORGE PICKERSGILL. Born March 1635 Ilton. Son of Richard & Alice. GEORGE PICKERSGILL. Bap. 6.3.1726 Kirkby Malzeard. Son of John. [Ref. IGI]. GEORGE PICKERSGILL. Born 1756 Kirklington. Died 1831 Newcastle. Son of Richard & Eliz. Ascough. GEORGE PICKERSGILL. Bap. 1.9.1771 Kirkby Malzeard. Son of Charles [b.1730].Married Mary Metcalf. in 1799. see June Howell’s letter above. GEORGE PICKERSGILL. Died 1766 in Masham. Inventory of his goods & Chattels. For 2 Carts and cart gear belonging. £4. For 2 Hay stacks. £3. 10s. For 9 sheep. £4 10s. For corn sown down. £1. 5s. GEORGE PICKERSGILL. Yeoman of Grewelthorpe made his will on 22.7.1837. [Masham Peculiar Court]. GEORGE PICKERSGILL. Born C. 1807 Middleham. A widower in 1851. Brother of Isabella the laundress. GEORGE PICKERSGILL. Born C 1821. Died 13 Nov 1868 Kirkby Malzeard. Son of Simon & Elizabeth Lofthouse.. Married to Mary of Galphay. Grave of George Pickersgill & Mary. & son George. Kirkby Malzeard. GEORGE PICKERSGILL. Born C 1852 Galphay. Died 27.6.1879 Kirkby Malzeard. Son of George & Mary. See grave above. GEORGE PICKERSGILL. Born C. 1852 Whitby. Son of Martin the railwayman. Living Whitby in 1871. an engine cleaner. GEORGE PICKERSGILL. Born C. 1875 Masham. A Cartwright. Son of William [the groom] & Elizabeth. GEORGE PICKERSGILL. Born C. 1878 Middlesboro. Son of Christopher the joiner & Margaret. GEORGE PICKERSGILL. Born 1885 Ripon. Son of Thomas & Mary Metcalfe. GILBERT PICKERSGILL. Lived at Ringbeck, Kirkby Malzeard in 1626. It was reported in the court held at Kirkby Malzeard church on 26th Sept. 1626 that 2 people had said a pater nosta after the funeral of an old wife who had died at Gilbert’s house. They were excommunicated. GRACE PICKERSGILL. Born 22.5.1656 Kirkby Malzeard. Dau of Thomas & Julian. [Ref. IGI]. HANNAH PICKERSGILL. Born C 1846 Galphay. Dau of Christopher & Eliz. Gregg. HARRY PICKERSGILL. Born 1888 Galphay. Son of Thomas & Mary Metcalfe. HECTOR MACDONALD PICKERSGILL. Born C1901 Masham. Son of Joseph [the grocer] & Rose. HENRIETTA PICKERSGILL [Nee Pratt]. Born 23.1.1895 Copt Hewick. Died 9.3.1976 Laverton. Dau of William Carling Pratt. & Henrietta Gladys Kirkup. Married Edgar Pickersgill in 1920. See picture of Henrietta above. HENRY CHAPMAN PICKERSGILL Born C1834.Ripon. Died 1902.Middlesborough. He was a Ripon boy. served his apprenticeship as a pupil teacher at the Trinity schools in Ripon. After he was an apprentice Chemist. 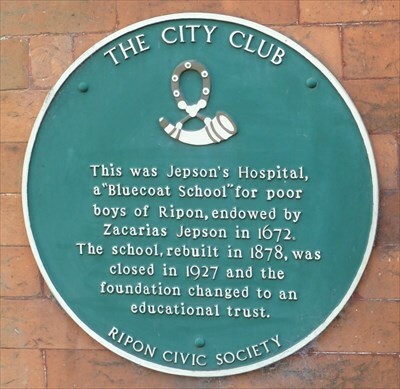 But he returned to teaching and became headmaster at Jepson’s Hospital in Ripon in 1873. From there he went to Guisborough & Middlesborough. where he died. Married to Annie and they had 8 children. HENRY PICKERSGILL. Born C1851 Kirkby Malzeard. Son of John & Mary. HILDA PICKERSGILL. Born 15.10.1897 Masham. Died 19.4.1988. Swindon. dau of Joseph & Rose. Married Frederick George Westall. 21.4.1924 Masham. ISABELLA PICKERSGILL. Spinster of Grewelthorpe made her will 27.9.1851. [Masham Peculiar Court]. ISABELLA PICKERSGILL. Born C 1800. Buried 5.9.1851. Grewelthorpe. ISABELLA PICKERSGILL. Born C. 1803 Grewelthorpe. Died Oct. quarter 1881. A laundress in Middleham in 1881. Sister of George. ISAAC PICKERSGILL. Born 1676 Norfolk. Dau of John & Ann Wrigglesworth. ISAAC PICKERSGILL. Born & Died 1880 Ripon. Son of Thomas & Mary Metcalfe. JAMES PICKERSGILL. Born C. 1853 Galphay. Son of Christopher the carpenter & Elizabeth Gregg. He was a carpenter in Azerley in 1891. Married Alice Hutchinson. of Pateley Bridge in 1879. The following information taken from ancestry.com site. James was Joiner at Bewerly Estate for Squire Yorke. Lived in Pateley Bridge after moving from the village of Galphay near Ripon. Married to Alice . They had two sons and four daughters. Arthur died as a result of a sports accident (cricket or rugby). John worked in the quarries after leaving school (Bewerly). Moved to Kenton Quarry Newcastle upon Tyne . Annie married ? Derrick an Irish labourer involved in building the local reservoir at Scarr. (won the Military Cross/ medal in WW1). Had several children Annie, John, William Mary, Kitty Joseph and Sydney. Kate became housekeeper to Tommy Bailey railway signalman at Pateley Bridge a widower with one son. Frances stayed single. Ran the Crown Hotel in Pateley Bridge, then was a cook at a methodist college in Ilkley, before retiring to Pateley Bridge. Fanny married Charles Jolly in Leeds, an engineer at Kirkstall Forge (originally from Ipswich in Suffolk. They had 3 daughters Betty who died in childhood (diabetic). Margaret who died in her early forties and Mary who lived in Horsforth all her life until moving into care aged 90 in Leeds. James died in Pateley Bridge having suffered from asthma for many years. Alice died suddenly in the kitchen of the crown hotel Pateley bridge visiting her daughter Frances. JAINE PICKERSGILL. Born 14.4.1654 Ilton. Died 1657 Ilton. Dau of John & Ann Turner. JANE ELIZA PICKERSGILL. Born C1823. of Bramley Grange, Grewelthorpe. Buried 3.5.1841 age 18. JANE PICKERSGILL. Born C. 1847 Middleham. Dau of Charles the Horse breaker & Prudence. JENNETT PICKERSGILL. Married Christopher Williamson. of Ellingstring at St. Mary’s Church Masham on 17.11.1612. JOHN PICKERSGILL. Died June 1602 Ilton. JOHN PICKERSGILL. Born C 1622 Ilton. Died March 1687 Ilton. Son of Richard & Alice. Married  Ann Turner. Masham 31.1.1646. Married  2.10.1656 Jaine Wetherill. of Masham. Married  Joan Beckwith. of Masham. on 28.4.1667. JOHN PICKERSGILL. Bap 24.8.1651 Masham. Died 1698 Ilton. Buried in Masham Churchyard. Son of John & Ann Turner. Married 12.12.1683 Ann Wrigglesworth. of Masham. He was a fellmonger.Dave Pickersgill has the following research which differs from above. JOHN PICKERSGILL. Born 1651 Masham. Died 8.2.1695 Methley.Son of Robert & Margaret Saynier. Married Ann Wrigglesworth. [1655-1729] They had 5 children. JOHN PICKERSGILL. Born 1688 Angram Cote. Died 29.8.1752 Ellingstring. Buried in East Witton churchyard. Son of John & Anne Wrigglesworth. Married 7.6.1732 Elizabeth Thompson. of East Witton. JOHN PICKERSGILL. Buried 9.12.1704 Grewelthorpe. Married Sarah Beckwith. of Kirkby Malzeard in 1701. [see letter from Nicola Simpson above]. See will at bottom of this page. JOHN PICKERSGILL. Bap 1704. Possibly Son of John & Sarah Beckwith. JOHN PICKERSGILL. Bap. 31.5.1713 Kirkby Malzeard. Son of Thomas. [Ref.IGI]. JOHN PICKERSGILL. Had land at Low Moor, Nutwith side, Grewelthorpe. 2roods, 23 perch, mentioned in the Enclosure award 1782. JOHN PICKERSGILL. Lived Graygrete Laverton. Married Isabel. Died 1774. Owned land in Grewelthorpe & Laverton. Father of Charles & Thomas.Will of John Pickersgill.I John Pickersgill of Graygrete in the township of Laverton Parish of Kirbymalzeard in the County of York Yeoman Being weak in body but of Sound and perfect memory Praised be Almighty God for the same do make and publish this my last Will and testament as follows First my will and great desire is that all my Just debts be fully paid and discharged and for that Intent I charge the Redemption of all my mortgaged Lands at Grewelthorp in the said Parish and Graygrete aforesaid with payment- thereof and likewise my personal Estate. And after the payment of my Just debts the remaining part of the produce of my Effects I give and bequeath to Isabel Pickersgill my Dearly beloved wife with full power to sell and dispose of all my Lands at Grewelthorpe and Graygrete aforesaid for the payment of my Debts as above mentioned and I desire Charles Pickersgill and Thomas Pickersgill my sons to aid and assist their mother in the Sale of my Lands and other things wherein they can be of Service to her and for their trouble and Expenses I order they shall be paid and all my goods Chattels and personal Estate after the payment of my Debts I give and bequeath to Isabel Pickersgill my said wife whom I appoint Sole Executrix of this my last will and testament revoking all former and other Wills In witness whereof I John Pickersgill have hereunto Set my hand and Seal this twenty fifth Day of January in the Year of our Lord One thousand Seven hundred Seventy twoSigned Sealed Published and declared by the said John Pickersgill for and as his last Will and testament in presence of us and Wittnessed by us in his presence and at his requestJohn Pickersgill [signs]Leonard Burrill [signs]Christopher Lofthouse [signs]John Spence [marks]. JOHN PICKERSGILL Bap. 18.12.1727 Kirkby Malzeard. Son of John. [Ref.IGI]. JOHN PICKERSGILL. Bap.9.10.1731 Kirkby Malzeard. Son of Charles. [Ref.IGI]. JOHN PICKERSGILL. Born C 1733 High Jervaulx. Died 9.5.1794 Ellingstring. Son of John & Elizabeth Thompson. A Butcher he Married  Elizabeth King. 1.8.1764 Masham. Married  17.6.1773 Jane Nottingham of East Witton. JOHN PICKERSGILL. Born 1745. Died 1822. Son of Richard & Eliz. Ascough. JOHN PICKERSGILL. Born 1764.Ellingstring. Died 13 .1.1782 Ellingstring. Son of John & Elizabeth King. JOHN PICKERSGILL. Bap Aug 1769. Son of Charles. JOHN PICKERSILL. Born C. 1815 Studley. Son of Simon & Elizabeth Lofthouse. Married to Mary of Kirkby Malzeard. Living Azerley in 1861. Visiting Simon in 1891 possibly his brother. JOHN PICKERSGILL. Born C. 1818 East Witton. Son of Isabella the laundress. Pauper in 1851. 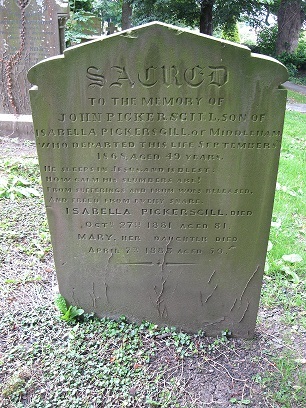 Grave of John Pickersgill [1818 – 1868] & his mother Isabella & Sister Mary. Middleham churchyard. JOHN PICKERSGILL. Born C 1862 Galphay. Son of Simon & Catherine. JOHN HUBERT PICKERSGILL. Born1878 Ripon. Son of Thomas & Mary Metcalfe. JOHN PICKERSGILL. Born C 1888 Masham. Son of Joseph [the grocer] & Rose. JOHN PICKERSGILL. • In 1890 Masham trade directory he was listed as a surveyor, collector, and inspector, Masham Local Board. JOSEPH PICKERSGILL. Born 1710 Masham. Son of Thomas & Elizabeth. JOSEPH PICKERSILL. Born Plover Hill. Bap 14.3.1803 Kirkby Malzeard, Son of George & Mary Metcalf. Married Ellen Hood. of Baldersby. Living Dewsbury in 1851. See June Howell’s letter above. JOSEPH PICKERSGILL. Born C 1826 Kirkby Malzeard. Son of Simon & Elizabeth Lofthouse. JOSEPH PICKERSGILL. Born C 1851. Galphay. Son of Christopher & Elizabeth Gregg. JOSEPH PICKERSGILL. Born C. 1860 Galphay. Married to Eleanor of Staveley. Farmer at Hay a Park Knaresborough. in 1891. Brother of William. JOSEPH PICKERSGILL. Born 1865 Hustwaite. Married to Rose of Masham. He was a grocer, had a shop in Masham market place in 1891. This could be the Joseph who was a bellringer in Masham in 1890. JOSEPH PICKERSGILL. Born C. 1876 Grewelthorpe. Son of James. Grandson of Christopher the carpenter. He was a carpenter’s apprentice in Azerley in 1891. JOSEPH PICKERSGILL. Born 6 Feb 1876 Galphay. Son of Thomas & Mary Metcalfe. Married to Ada [born 1876]. Farmer living Red House Winksley in 1939. JOSEPH PICKERSGILL. Lived Red House Farm. Winksley. Married to Ada. JOSEPH PICKERSGILL. Born C 1885 Masham. Son of William [the groom] & Elizabeth. In 1901 he was a postman in Masham. LAWRENCE PICKERSGILL. Born 1610 Masham. Died 1637 Masham. Son of Christopher & Ann Hodgson. LEONARD PICKERSGILL. Buried 3.1.1706 Lived in Grewelthorpe. LILIAN PICKERSGILL. Born C 1890 Masham. Dau of Joseph [the grocer] & Rose. MARGERETT PICKERSGILL. Born May 1637 Ilton. Dau of Richard & Alice. MARGARET PICKERSGILL. Bap. 6.12.1701 Grewelthorpe. Dau of William. [Ref. IGI]. MARGARET PICKERSGILL. Born C.1846 Grewelthorpe. Wife of Christopher the joiner. MARGARET PICKERSGILL. Born C 1873 Masham. Dau of William [the groom] & Elizabeth. MARTIN PICKERSGILL. Born C. 1811 Grewelthorpe. Died 3.6.1876. Whitby. A coal agent in Whitby in 1851. Married to Elizabeth of Sleights. A railway weighman in Whitby in 1871. Left under £100 at death. MARY PICKERSGILL. Born 1717 Masham. Dau of Thomas & Elizabeth. MARY PICKERSGILL. Born 1747. Died 1809 Kirklington. Dau of Richard & Eliz. Ascough. MARY PICKERSGILL. Bap.30.8.1762 Kirkby Malzeard. Dau of Charles. [Ref.IGI]. MARY PICKERSGILL. Bap. 3.11.1790 Grewelthorpe. Dau of George. MARY PICKERSGILL. Bap. 16.1.1801. Dau of George & Mary Metcalf. MARY PICKERSGILL. Born C. 1825 East Witton. Dau of Isabella the laundress. Unmarried in 1881 in Middleham. MARY PICKERSGILL. Born C 1864 Masham. Unmarried servant in 1891 in Masham. Dau of William [the groom] & Elizabeth. MARY HANNAH PICKERSGILL. Born 1890 Galphay. Dau of Thomas & Mary Metcalfe. NORAH PICKERSGILL. Born 1900 Galphay. Dau of Thomas & Mary Metcalfe. RICHARD PICKERSGILL Living Ilton in 1589 was brought up before Masham court for keeping a peddars [pedlars] wife in his house. His neighbours had complained. [Ref. History & Antiquites in Masham]. .RICHARD PICKERSGILL. Born June 1685 Ilton. Died 1723 Angram Cote. Yeoman. Married 30.11.1708 to Alice Croft. of East Witton. Son of John & Anne Wrigglesworth. RICHARD PICKERSGILL. Born C1712 Angram Cote. Died 1783 Kirklington. Son of Richard & Alice Croft. Married Elizabeth Ascough. of Masham in 1738 [See Ascough page]. RICHARD PICKERSGILL. Born C1739 Ellingstring. Died 23.6.1807 Wath. Son of Richard & Eliz. Ascough. Married Elizabeth Auton. in 1763 in Kirklington. RUTH PICKERSGILL. Born C 1872 Middlesboro. Dau of Christopher the joiner & Margaret. In 1891 she was a milliner. SARAH PICKERSGILL. Bap. 15.6.1733 Kirkby Malzeard. Dau of John. [Ref. IGI]. SARAH PICKERSGILL. Bap.17.7.1757 Kirkby Malzeard. Dau of Charles. [Ref. IGI]. SARAH PICKERSGILL. Born C. 1794 Sutton Grange Grewelthorpe.Unmarried annuitant in 1851. SARAH EMILY PICKERSGILL. Bap 31.10.1873. Ripon. Died 28.12.1956. Rosedale, Yks. Dau of Henry & Ann Young. Married *Albert Fuguel. *on 30.12.1915 at Stanton, Durham. [Ref. IGI]. SIMON PICKERSGILL. Born 1703 masham. Son of Thomas & Elizabeth. married Elizabeth Hall. of Topcliffe. SIMON PICKERSGLL. Born C.1776. Died April 1843. Married Elizabeth Lofthouse. 24 May 1814. in Masham. SIMON PICKERSGILL. Born C. 1820 Studley. 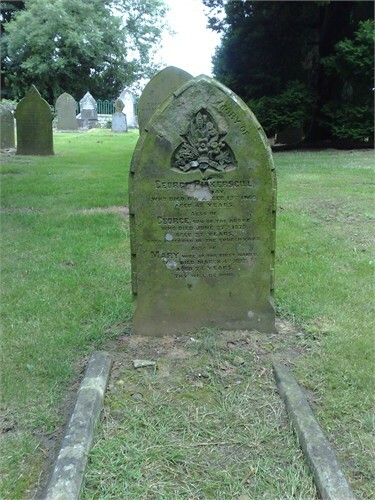 Died 1 Jan 1897 Knaresborough. Married to Catherine of Warsill. Farmer at Hay a Park Knaresbro. in 1891. SIMON PICKERSGILL. Born March 1854 Galphay. Died 27.6.1910 Kirkby Malzeard. Son of George & Mary. Married to  Martha Ann Baul in 1892. Married  to Martha Ann Richmond Pearson. in 1900. See grave below. 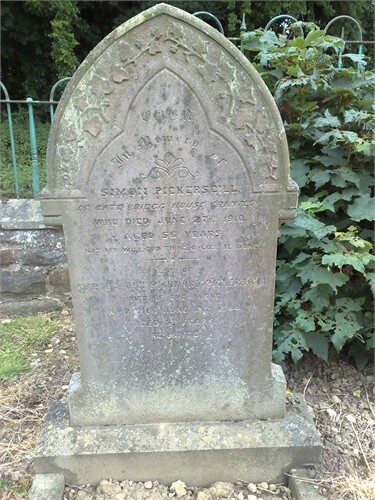 Simon Pickersgill grave Kirkby Malzeard. SIMON PICKERSGILL. Born C 1856 Galphay. Son of Christopher & Elizabeth Gregg. SUSANNA PICKERSGILL. Born April 1641 Ilton. Dau of Richard & Alice. THOMAS PICKERSGILL. Lived Nutwith Cote Grewelthorpe.Made will 1.6.1609. [Masham Peculiar Court]*THOMAS PICKERSGILL. * Born 1678 Masham. Died March 1744. Son of John & Ann Wrigglesworth. Married  Elizabeth. Phillis Robinson. of Burnsall. THOMAS PICKERSGILL. Born 1692. Died 1696. Son of John & Ann Wrigglesworth. THOMAS PICKERSGILL. Bap.19.6.1715 Kirkby Malzeard. Son of Thomas. [Ref.IGI]. THOMAS PICKERSGILL. Bap. 19.2.1740 Kirkby Malzeard. Son of John. [Ref.IGI]. THOMAS PICKERSGILL. Born C 1788 Grewelthorpe. Married to Ann Cook. of London. THOMAS PICKERSGILL. Born C. 1795 Grewelthorpe. Son of Thomas & married to Mary of York. Living Middleham in 1851. THOMAS PICKERSGILL. Born C 1844 Ainderby Steeple. Died 26.9.1928 North Stainley. Son of Christopher & Elizabeth Gregg. **Dave Pickersgill says [son of Charles & Thomasin Parnaby.] Married Mary Metcalfe. [1852-1916] of North Stainley. in Dec 1875. in Grewelthorpe. See grave below. 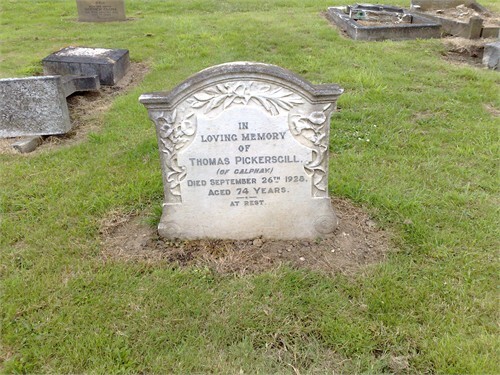 Grave of Thomas Pickersgill in North Stainley. THOMAS PICKERSGILL. Born C. 1854 Whitby. Son of Martin [railwayman] & Elizabeth. THOMAS PICKERSGILL. Born C 1871 Masham. Shoemaker. Silver St. Masham. Son of William [The Groom] & Elizabeth. Served in territorial army reserves in WW1. Service No. 2431. Volunteered Age 45 Discharged in 1916 Physically unfit. Had suffered enteric fever in South Africa. He had tattoos on both arms. Married to Ada Smith. on 8 July 1902. St Marys Masham. He was 5ft 9” blue eyes, sallow complexion, grey hair. WILLIAM PICKERSGILL. Born 1712 Masham. Son of Thomas & Elizabeth. WILLIAM PICKERSGILL. Born C 1720. Buried 15.2.1810 age 90. Lived Grewelthorpe. WILLIAM PICKERSGILL. Bap. 5.2.1737 Kirkby Malzeard. Son of John. [Ref.IGI]. WILLIAM PICKERSGILL. Bap. 5.10.1788 Grewelthorpe. Son of William. WILLIAM PICKERSGILL. Born C 1837. Masham. A Groom. Married to Elizabeth of Masha m.
WILLIAM PICKERSGILL. Born C. 1856 Kirkby Malzeard. Son of John & Mary. WILLIAM PICKERSGILL. Born C1856 Galphay. 1911.census. Living Blossomgate Ripon. House painter. married to Elizabeth of Thornton le Street. WILLIAM PICKERSGILL. Born C. 1871 Galphay. Farming with brother Joseph in Knaresbro. in 1891.WILLIAM PICKERSGILL. Born C 1879 Masham. Son of William [the groom] & Elizabeth. Will of JOHN PICKERSGILL of Grewelthorpe 1705. Bond for the administration of his goods granted 1st October 1705 to Sarah Pickersgill of Grewelthorpe and William Beckwith of Roomer. Yeoman.December 19th 1704.A true inventory of the goods and chattels of John Pickersgill of Grewelthorpe in the County of York, deceased, appraised by Jo. Pickersgill, Richard Burniston,Tho. Ripley and Tho. Cockbye. Inprimis his purse and apparel £2.0.0d.4 Kine and 2 Stears. £12.0.0d.3 Whyes and 3 calfes. £6.0.10d.Note A whye is a heifer of any age up to 3years, or until she has had a calf.1 Mare £2.10.0d.50 sheepe £10.0.0d.4 webbs £2.10.0d.2 looms and work geare. £1.10.0d Hay and corne £6.0.0d.1 carte and 1 cope with geare and other sort of geare belonging £0.10s.0d1 hogg £0.15s.0d1 pannill chest, 1 round table, 1 wanded chaire, 6 pewter dishes and 6 plates with the rest of household stuffe belonging. £2.10.0d.Note A wanded chair is a wicker chair.Debts owing to the deceased £21.16s.6d.Total £68.2s.4d.Debts owing by the deceased. Inprimis his funeral expences £6.0.6d.To Oliver Beckwith. £3.5s.0d.To Mr.Lame [or Laine]. for rent. £1.15s.0d.To Charles Greeson. £5.0.0d.To Willam Moaser. £0.10s.0d.Total £16.10s.0d. Researched by Barbara Bradley October 2011.